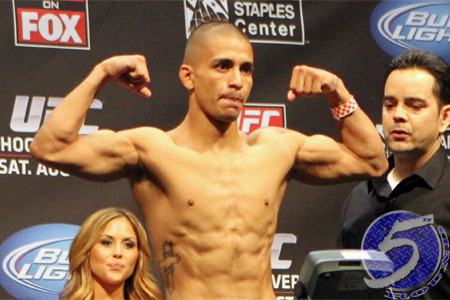 John Moraga (Pictured) set the tone for how spectacular “UFC on FOX 4” was going to be on Saturday night. The flyweight made his big league debut in spectacular fashion by putting Ulysses Gomez to sleep with a vicious assault during the first fight in last night’s card. His Octagon premiere has been a long time coming, and he certainly made the most of his opportunity. Moraga bumped his professional record to an impressive 11-1 mark. UFC on FOX 4 took place in Staples Center in Los Angeles. Note: John was the first interview of the night and we experienced some technical difficulties during our chat. We edited it as best we could. Sorry about that.